The slopeside private residences at One Steamboat Place are located just steps from the Gondola and offer ski in/ski out ease. 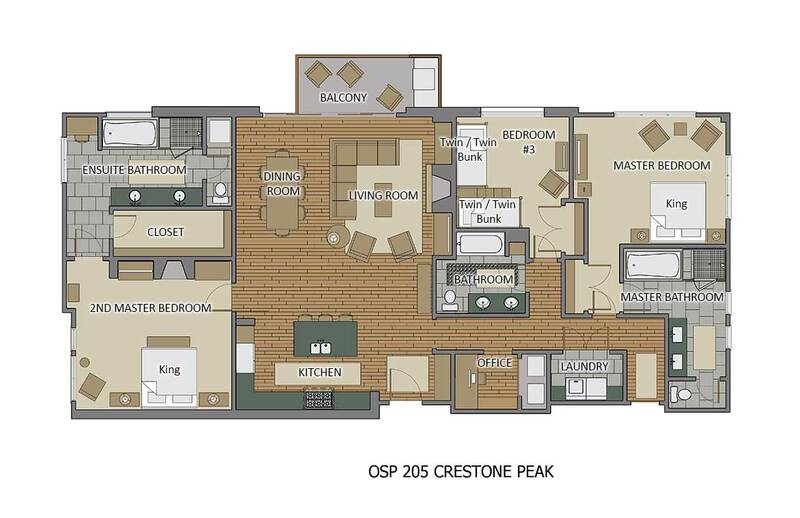 Crestone Peak is a unique residence offering views of the ski area from the living room and every bedroom. The deck directly faces Mt. Werner with views to the north of the base area activity and to the south of the beautiful Yampa Valley. You’ll enjoy the sounds of Burgess Creek as it runs adjacent to this residence. Crestone Peak is located close to the One Steamboat Place Game Room and the Little Tyke’s Playroom to the delight of kids and parents alike. You also have easy access to the ski lockers, the Plaza level and the Member’s Gathering Room where the daily complimentary hearty Continental breakfast and fun Après Ski hors d’oeuvres and drinks are served. This residence features a large living area with a spacious open floor plan connecting the dining and living areas to the kitchen with plenty of room to relax together. State of the art A/V equipment provides hi definition entertainment after a full day of activity. The walkout deck extends the living room and offers lovely natural light and great views. The professionally equipped kitchen offers a large kitchen island with extra seating for the whole family, Viking appliances and a Nespresso machine for those coffee aficionados in your group. Outdoor grilling is a cinch with the built-in Viking gas grill on the deck with its stunning views of Mt. Werner. The adjoining dining area features a handcrafted dining table that seats 10 while the beautiful living room is highlighted by a large, inviting fireplace and updated furnishings. All three spacious bedrooms are beautifully appointed with the master and junior master bedrooms enjoying the added ambiance of a large gas fireplace. The bedrooms boast high-end mattresses, contemporary décor, televisions, plenty of room to store your clothing and terrific views of the base area, Mt. Werner and the Yampa Valley. The master bathroom is home to a large walk-in closet, a separate make-up area, a steam shower, Jacuzzi tub, dual sink vanity and provides exceptional views of the base area. The junior master also provides a luxurious spa-like ensuite bathroom with welcoming natural light, a steam shower, and Jacuzzi tub. The bunk room offers two sets of custom built-in Twin bunks and an ensuite bathroom so kids have their own space to get ready for skiing in the morning and later for bedtime. Among the standout amenities at Crestone Peak residence, you’ll find a secluded home office which includes an iMac home computer. The residence also offers high-speed WiFi for those essential work meetings and emails. Enjoy all the signature touches throughout One Steamboat Place provided by Timbers Resorts including exquisite gathering areas and one of the most beautiful day spas in the West. In addition to Steamboat’s recreational opportunities, One Steamboat Place has a state-of-the-art fitness facility, pool and hot tubs, a motion studio, a family game room, and a Little Tykes playroom for the kids. With numerous in-residence catering options, complimentary Continental breakfast, ski valet and complimentary on-call local shuttle, the Private residences at One Steamboat Place have defined the first-class experience at Steamboat.